OLS is an all volunteer organization and became a nonprofit corporation in the state of Maine in May of 2015. Our 501(c)3 status was granted on July 23, 2015. We are a secular organization that happens to primarily work with Buddhists as they comprise the majority in Ladakh. We have no litmus test based on religion or heritage as to whom we are willing to help. Our organization grew from an experience in 2011 when most of our board members traveled to Ladakh to work on a humanitarian expedition where we had the privilege of experiencing the stunning beauty of this remarkable Himalayan enclave. The highlight of the trip was getting to meet and work in close contact with people from smaller more remote villages who are know for their gentle and friendly nature. Ladakh faces challenges which seem particularity daunting because of the difficult mountain terrain which makes it hard to deliver services even under the best of circumstances. Many villages are unreachable for much of the year as passes close during the winter. After meeting and getting to know many villagers a few things became apparent. There's is a remarkable commitment to education even as many village schools struggle for the most basic resources. Many young people aspire to pursue their education beyond secondary school and it was apparent that most lacked the financial resources to pursue their dreams. We also became acutely aware of the fact that women and girls faced some unique challenges. Like women all over the world they can be victims of abuse, divorce, and poverty. Those problems are amplified in Ladakh because of insufficient support services available to them. as we had an opportunity to observe their integrity, courage, and commitment to women's rights. Their work resonates with our board as we've worked on the same issues here at home. Our mission is to assist local organizations in their initiatives to improve the well-being of the women, children, and families of Ladakh. Our vision is to support initiatives that improve the lives of women, children, and families in Ladakh by promoting self-sufficiency through education and training, creating job opportunities, and providing emergency assistance and temporary crisis housing. 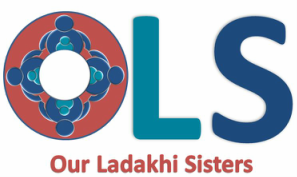 Our Ladakhi Sisters (OLS) aims to collaborate and build strong alliances with local organizations and to respect their knowledge and cultural heritage to ensure funds have maximum impact. We are particularly interested in supporting efforts that address some of the unique challenges facing women and girls in Ladakh, and we committed to being a significant supporter of need based scholarships. Ladakh is tucked away in the Himalayas in the northern most tip of India. Ladakh is part of the Indian state of Kashmir and Jammu and means “land of passes “. The ancient Silk Road cuts through the region, which is often called “Little Tibet” because of the sizable population individuals with Tibetan ancestry and the large population of practicing Buddhists. Pakistan lies to the west and north and Tibet lies to the east. Located in the rain shadow of the Himalayas it’s a high altitude desert known for its astonishing beauty and gentle people and it remains one of the driest and highest inhabited places on earth. There are over 200 isolated villages with very limited road access and many villages remain cutoff during winter months as the mountain passes close. Eastern Ladakh is an extension of the Tibetan Plateau where nomadic people called Changpa still carry on their traditions. In the near future it will be home to the largest solar array on the planet which will produce 5,000 megawatts and cover 20,000 acres. Although there are changes coming, the Himalayas have kept Ladakh geographically isolated and it remains very distinct from the mainstream Indian culture. Although Ladakh is very peaceful there is constant tension on the border with Pakistan where the highest battleground in the world exists on the Siachen Glacier (22,000’). On the eastern border with Tibet there is tension with the Chinese army and incursions into Indian territory are frequent. In recent years Ladakh has become a destination for many international trekkers and tourists. Some travel to Ladakh in hopes of catching a glimpse of the elusive snow leopard and other exotic wildlife, while others come to see the many monasteries and stupas that dot the landscape. Regardless, everyone comes to see the stunningly beautiful mountains. Valleys are typically 11,000’+ and the highest peak is over 25,000’. These beautiful mountains also create huge challenges in delivering basic services like education and healthcare. However, there are local organizations working to overcome these challenges and the OLS will be there to help them achieve shared goals.